Rabbit Air crafts some of the best air purifiers on the market and their BioGS 2.0 is no exception. It’s appearance isn’t as well thought out as its pricier sibling the MinusA2, but its performance will not disappoint. Nor will the price. Delivered to your door for well under five hundred dollars the Rabbit Air BioGS 2.0 will serve you well for years to come. Granted it might be a little more expensive than some. However, you will not find a better unit for a lower price. This purifier has all of the things we look for in out top rated purifiers. First, it is equipped with both HEPA and activated carbon filters. Second, there aren’t many better purifier companies than Rabbit Air. Third, outstanding customer service and a solid warranty make add a sense of security not available in many low price alternatives. And, finally… this unit just works. Day after day it toils away without much noise, churning out clean air for you and your family. Editor’s note: We originally published the review of the BioGS 2.0 Air Purifier in May of 2015. However, we revisited the product in 2018 and completely revised the original article for accuracy, relevance, and in consideration of new developments in purifier technology. A few things have changed, but overall this is still a great value and top performer. We’re no stranger to the BioGS line and while it doesn’t have the looks it’s priced right and packed with great features. Some of our favorites are an efficient 4-stage filtration system, auto air quality monitoring, and a rock solid childproof safety. The Rabbit Air BioGS 2.0 provides an efficient 4-stage filtration system. The stages of the filtration process include a pre-filter, activated carbon filter, the impressive BioGS HEPA filter, and a negative ion generator. 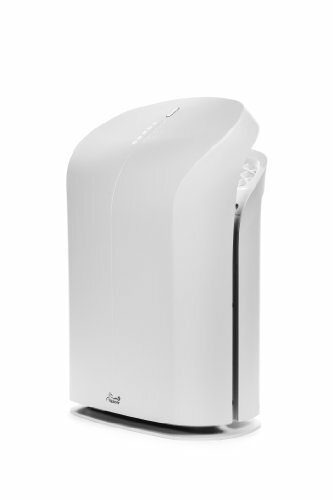 Like many higher priced air purifiers, Rabbit Air’s BioGS 2.0 includes a permanent but washable pre-filter. Its sole purpose is to protect subsequent stages. It’s essentially a shield against large airborne particles like dust mites, pet hair, and pollen. The second stage in the filtration process is an activated carbon filter. Activated carbon is just about the only way to remove VOCs, and odor from pets, cooking and even smoking. An incredibly porous structure provides a new home for nast particles too small to be captured by the next stage. The third stage would be the BioGS HEPA filter. This is really where a quality purifier separates itself from the pack. It is important to understand that the HEPA filter is one of the most expensive components to produce in a purifier. Cheaper units may claim to have HEPA style filtration or HEPA filters, but true HEPA filtration will increase a purifier’s price significantly. However, you really get what you pay for and a high quality filter will remove much more from the air than a smaller or cheaper imitation. It’s also important to understand, before purchase, that HEPA filters must be replaced at recommended intervals. Compared to the standard HEPA filter that most air purifiers on the market possess, the BioGS is specifically designed to maintain its performance for a longer period of time. According to the manual provided by the manufacturer, the BioGS filter can last for up to 18 months,while operating for 24 hours a day, given that proper care and maintenance are rendered. If the machine is only used for 12 hours per day, you can expect that the filter can last for approximately 3 years. So while the price tag of replacement filters might be a little off putting… lower quality units will require a pile of replacements over the span of three years. The last stage in the filtration process is Rabbit Air’s negative ion generator. This feature can be toggled on and off, and according to the manufacturer it produces miniscule levels of Ozone. We really recommend keeping it turned off while you’re at home, and use it while you’re away on vacation or running errands. But, the team at PureAirSupply.com is insanely cautious about recommending anything that produces any level of Ozone. The Rabbit Air BioGS 2.0 is very effective for a wide range of customers. From Asthmatics to smokers who refuse to smoke outside. Part of what makes it so effective is its intelligent sensor that measures what’s floating around in the room. When it senses more pollen, smoke, dust or dander the sensor tells the machine to kick it up a notch. When things return to normal the sensor slows the fan; saving energy and maintaining its ultra quiet operation. People suffering from asthma and allergy will really appreciate this feature. It monitors indoor air quality and takes action before you realize that the elevated pollen count is triggering allergy symptoms. To be quite honest we, along with others who use the Rabbit Air BioGS 2.0 firsthand, were surprised by how quiet the machine can be. Granted, the BioGS isn’t as quiet as the pricier Rabbit Air MinusA2, but it is still surprisingly quiet compared to most air purifiers on the market. The machine does emit some ambient noise but it’s more of a faint white noise that you’ll probably only hear if you’re listening for it. In addition to its already impressive list of features the BioGS is equipped with a five speed fan. Setting the machine to low produces hardly any noise. However, even at its highest setting the purifier noise isn’t obtrusive. The machine also features a filter replacement indicator that lets you know when its filter needs to be replaced. But, like we said earlier… replacement intervals are spaced out over years, not months. So don’t expect to see it begging for a new filter anytime soon. We’re also big fans of the childproof feature that stops the machine if there’s “tampering” detected. Like when the the front panel is removed. This is a great feature for those of us with curious kids running around the house. If you are looking for an air purifier that can help you purify the air indoors either in your home or office, the Rabbit Air BioGS 2.0 is an incredible option. It has all the necessary features, plus some additional luxuries. Despite the price tag that may shock some shoppers, we think it’s an incredible value. Bottom line, the BioGS is a great option for the majority of purifier shoppers. From smokers, to allergy sufferers, to pet owners this machine will certainly impress. The BioGS 2.0 comes in a number of performance and appearance variations. The 625A model adds gains in performance as well as the option to add a splash of color to the case. So other than color options what does the 625A add? First it covers a larger area; up to 625 square feet. The upgrade also gives you higher CADR figures (Dust= 189, Pollen= 165, Smoke= 152). The fan is a bit more powerful… on high it moves an addition 20 cubic feet of air every minute. But, that increases noise a little on the top three speed settings. The bottom two speeds produce the same noise as the BioGS 550, but when you hit the third speed you see about 20 dB more on each setting. This purifier’s stronger fan also draws more power. It maxes out at 39 watts, or roughly ten more than it’s smaller counterpart. Despite the increase, though, this is still an Energy Star appliance. It’s easy to compare price… or performance. But, judging what you get for your hard earned cash is a bit more complicated. That’s why we take the time to rate what a purifier provides for each dollar you spend… and will probably spend. From there the average of those criteria is used to publish a rating for a purifier throughout the site. If we didn’t take this approach, lower priced purifiers would typically receive much lower star ratings while purifiers north of one thousand dollars would earn 4 and 5 stars. That doesn’t really help anyone.